Have I told you lately how much I love Halo Heaven? They have tons of cheap tutus and dress-up items. And shipping is always free for orders over $20 (after coupon codes). Nothing is expensive on the site, but the closeout section is the best. 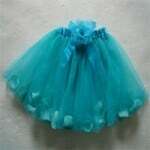 And, for February 29 only, use “LEAP” to receive 10% off your entire cart.This tutu is $2.25 with coupon code.